So on the bitterly cold night of February 27, a stellar lineup of Washington hands took the stage in Conte Forum. And, by BC police estimates, some 6,000 people, from the campus and the wider community, turned out for a discussion of “Catholic Politicians in the U.S.: Their Faith and Public Policy.” The event was filmed by C-Span and was broadcast several times in March. 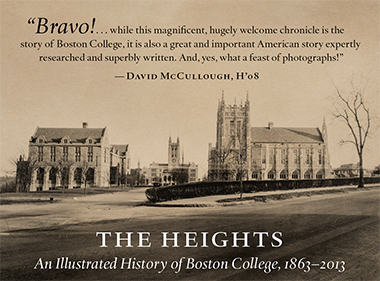 It was also shown live on Boston College’s website. Russert’s balanced ticket of a panel included James Carville, who helped engineer Bill Clinton’s presidential victory in 1992; Edward W. Gillespie, former chairman of the Republican National Committee; E.J. Dionne, a columnist for the Washington Post and onetime Rome correspondent for the New York Times; and Peggy Noonan, the best-selling author who served as speechwriter for Ronald Reagan and George H.W. Bush (for whom she turned the phrase “a thousand points of light”). When the panelists addressed the central question of balancing faith and public policy, each individually asserted that it is possible to be a good Catholic and a good Republican, or Democrat, or conservative, or liberal—whatever it was, actually, that he or she happened to be. And over the course of an hour and a half, the discussion touched, albeit sometimes briefly, on issues of gay marriage, labor unions, embryonic stem cell research, euthanasia, the death penalty, health care, social justice, and the war in Iraq. But the great challenge to the panel, as to many American Catholics, was the issue of abortion as it arises in the public arena, and the conversation circled back to it again and again. Carville, who introduced the subject early, called abortion “the mother lode issue.” He speculated that 10 percent of American Catholics accept the Church’s uncompromising opposition to the procedure (in fact, the figure is more like 42 percent, but among young Catholics—the so-called millennials born since 1977—the figure is indeed 11 percent); and he said each politician must heed personal conscience. Earlier in the evening, Dionne had joked that “the Church’s job in politics is to make all of us feel guilty about something.” “In the last election,” he said, “the Church did not seem to be an equal-opportunity guilt producer,” as the abortion issue overshadowed other moral concerns such as responsibility for poverty and war. In Noonan’s view, much of the defection that took place from the 1960s to 1980s involved social issues. “The Democratic Party almost seemed to have some kind of odd leftism imposed on it,” she said. The event was sponsored by BC’s Church in the 21st Century Center, which grew out of a University initiative in 2002 to serve as a catalyst for renewing the Church in the wake of scandal and for handing on the Catholic faith to young people. Some 1,200 students claimed tickets before the deluged organizers ceased counting, a turnout that “exploded all expectations,” said Timothy P. Muldoon, director of the center. Students got their own section up front, a wedge of white folding chairs that was guarded by student ushers. Undergraduates packed in at the last minute, pulling out cell phones to track down their friends. Sitting next to Lagaard, Kate Gazzaniga ’09, a Congregationalist from Glastonbury, Connecticut, said, “Regardless of whether you’re Catholic or not, it’s important to see that ultimately religion will come into politics.” Alicia Perez ’09 noted that the more liberal panelists stressed economic issues while “the Republicans and conservatives emphasized black-and-white issues like gay marriage.” She is from Bastrop, Texas, where, she said, “I’m considered pretty liberal. But here. . . .” Yousef Mustafa, a freshman from Jersey City who is Muslim, said one thing that stayed with him was Gillespie’s assertion that someone who favors abortion rights could address a Republican convention but that speakers at a Democratic convention could not diverge from the party line. BC faculty members also gave the evening high grades. “It was thoughtful, it was relevant, it was well attended,” said Alan Wolfe, professor of political science and director of the Boisi Center for Religion and American Public Life. Fr. Robert Imbelli, an associate professor of theology, too was pleased by the crowd’s interest, but he went on to say, “The event was a bare beginning,” that it ended just as the panelists were moving toward a “more personal engagement with issues of personal faith and theological vision.” A follow-up, smaller-scaled event is being planned by the C21 Center “to try and deepen the conversation,” according to its director, Muldoon. Details will be posted on the C21 website. An annotated list of background reading on the subject can also be found at the website. Michael Molyneux is a writer based in Sharon, Massachusetts.